The death metal giants from the Russian capital were willing to reply to all our questions and check in. -First of all, do you want to inform those who don’t know you about your past history. Dmitry (guitars, lyrics): Hi! First of all I would like to thank you for interest in our band! Well, Tantal’s history begun in 2004. Founders were Dmitry Ignatyev (guitar), Alexander Bessilin (guitar, vocal), Michael Krivulec (bass), Vyacheslav Gurovoy (drums). In 2005, we decided to change our singer, so we found Sofiya Raykova. Her voice has become an essential part of the band's music; the style of her singing varies from powerful screaming and growling to a refined clear voice. In January 2007 it was released a promo-CD called "Emotional distress". That work got a lot of positive comments and reviews from different Internet resources both in Russia and in Europe (Czech Republic, Poland, Germany). After that for the personal reasons Alexander Bessilin left the band. Now, Alexander Strlnikov takes up a place of the second guitarist. In the beginning of 2009 the first album "The Beginning Of The End" was released in Russia by famous Russian metal label Mazzar Records. The music of the début album is an original mixture of Progressive, Death, Thrash and Modern Metal, spiced with gloomy conceptual lyrics, female Death and clean vocals. After that this album got a worldwide distribution. 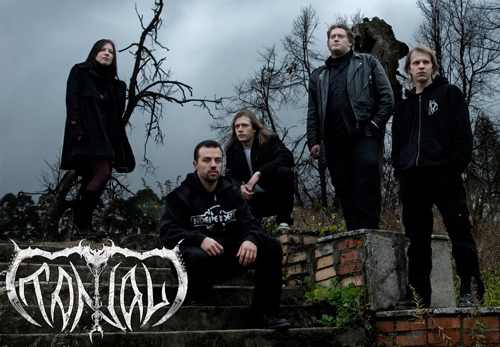 More info you can find at our official web-pages at www.tantalweb.ru and www.myspace.com/tantalband. -Was “The Beginning of the End” more of a step-by-step teamwork or more of a collage of past incomplete tracks that coincided like a puzzle under the guitarist’s supervision? Dmitry (guitars, lyrics): 2 songs (“Suicide” and “Controlled by Hate”) were already on the 2007 promo CD “Emotional Distress”, so we only changed and added some arrangements. But the rest of the songs were written with the new guitarist Alexander especially for the new album. -What was the main difficulty during the recording session? Did you need to take more takes of the vocals or was the first usually already OK? Sofia (vocal): The recording of “The Beginning of the End” was the first serious experience for all the band mates. We faced lots of troubles during the sessions, but we wanted to do our best on our debut album, so that is why it took a lot of time to record some parts. The main difficulty was in the end, when we were sitting in the control room and mixed all of the songs, because it’s difficult to get the right balance between all instruments. -Don’t you think the diffusion of bands with female presences has saturated the market? -Is there a lyric you are particularly in sympathy with? Is there something self-biographic about your lyrics? Dmitry (guitars, lyrics): As an author of the lyrics I can’t choose my favourite one, I changed it so many times and I almost hate them all at this moment (ha-ha). But most of them are self-biographic, because they’re a reflection of my experience and my inner world. -I appreciated your video too. How much did it cost and did the director have freedom or did you already have clear ideas about the final result before you entered in touch with him/her? -Are there countries outside the CIS that appreciated your album much more than others or has the response been balanced so far? Sofia (vocal): I think it was good appreciated in Europe, UK and USA. Most reviews and responses are coming from there. I can’t mention any special country and suppose it is balanced. Of course we try to extend the bounds and use all possible ways to promote the band, but it’s very hard especially for bands from Russia…but we’re trying! And we would like to thank all our promo agencies and labels in Europe, UK and USA for their help! -Is it hard to stand out in Russia because of the small scene or on the contrary easy since you have less professional competition? Dmitry (guitars, lyrics): From year to year the metal scene in Russia is getting bigger and bigger and there are a lot of excellent bands. It’s good because we have a good competition and it gives every band a reason to play better, to become more professional. Therefore it’s getting hard to stand out and we constantly need to develop our skills and write good songs; I think it’s very good! -What was the highest moment in your career and what the lowest? What was the funniest episode ever happened during a show? Dmitry (guitars, lyrics): The lowest moment was when we lost our second guitarist, we had almost decided to dismiss the band, and it was a hard time for all of us. As for the highest I think we haven’t achieved it yet! I can’t remember if there were any funny moments during a show, usually it happens after or before it, we’re all fond of jokes! Once we stole drum pedals of our drummer exactly before the show, when we all were ready to play he was searching for it in a rush and we all told him “You must hurry up!! !”…evil joke I know but we had laughed a lot. -Are you self-taught or did you take lessons or even get a degree from a music school? Sofia (vocal): All of us are self taught except Alexander – he graduated from 2 musical schools! I also take private vocal lessons to improve my skills. -Your favourite 5 all-time records? Dmitry (guitars, lyrics): 1. The Beatles “A hard day’s night”; 2. Iron Maiden “Somewhere in Time”; 3. Dream Theater “Train of Thought”; 4. Death “Symbolic”; 5. Cynic “Focus”. Sofia (vocal): 1.The Devin Townsend Project “Addicted”; 2. Stolen Babies “There Be Squabbles Ahead”; 3. Pin-Up Went Down – “2 Unlimited”; 4.Diablo Swing Orchestra – “Sing-Along Songs For The Damned And Delirious”; 5.Skindred - ”Babylon”. -Is there a band you consider undervalued and you’d like to recommend us? Dmitry (guitars, lyrics): If it’s about Russian metal bands I’d like to recommend our good friends “Everlost” – it’s modern death metal with some progressive elements, they have released already 3 albums, so I suggest to listen to them (www.everlost.ru). Another undervalued Russian band I think is “Hieronimus Bosch” – excellent Progressive Death metal, they’re known in Russia well but not many people know them abroad. -Do you have any plans for the future, any new songs? How are your endorsing deals going? 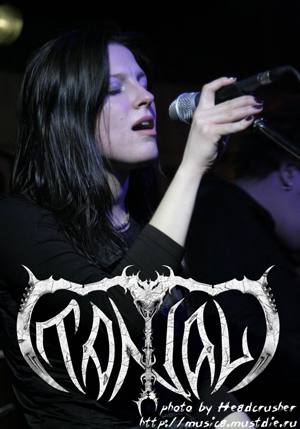 Sofia (vocal): We are working on the second TANTAL's album which will be called "Expectancy". At the moment the major portion of the material is ready, and the whole lyrics are finished. We are recording a demo of the songs and working on the arrangements. "Expectancy" will be a conceptual album with more various instrumental and vocal arrangements than our debut "The Beginning of the End". 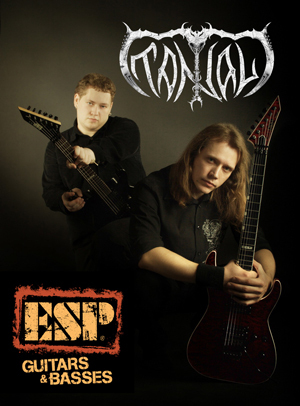 Recently the ESP Company produced special picks for TANTAL with our logo. We’re also planning to shoot another guitar demonstration. -Do you have any side-projects? Dmitry (guitars, lyrics): As far as I know our second guitarist is playing in the Gothic-metal band “Rosa Infra”. Sofia (vocal): I’m singing in the Modern-metal band “Val’kiriya”. -Is there an album you wish it were played at your funeral or a sentence you wish written on your grave? Dmitry (guitars, lyrics): I don’t think that it should be the whole album. Honestly, I haven’t thought about it yet, but I think the funeral-song list must contain Led Zeppelin “Stairway to Heaven”; Iron Maiden “No Prayer for the Dying”; nothing special. -Please feel free to add whatever info or message you need to communicate your fans. Sofia (vocal): We want to thank all people around the world who continue to buy CD’s thereby supporting musicians! Biggest thanks go to the people, labels and distribution agencies all over the world who support TANTAL and give us strength and inspiration. Also check our web pages at MySpace: www.myspace.com/tantalband and official web-site: www.tantalweb.ru and don’t be shy to leave your comments! Also thank your magazine for organizing this interview.